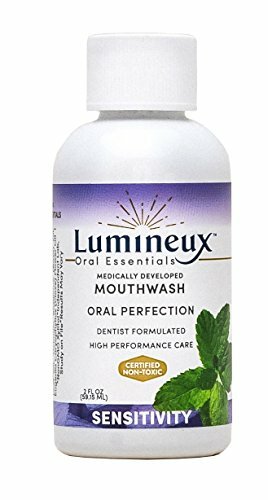 Oral Essentials Mouth Rinse: For a mouth that's fresh and moisturized... This invigorating blend of French essential oils, organic aloe vera juice, and salt from the Dead Sea was thoughtfully formulated in Beverly Hills, CA by some of the world's top dentists. After years of international research, these acclaimed professionals combined old world principles with the evidence based benefits of xylitol, a naturally derived sweetener extracted from fibrous plants that may reduce the risk of tooth decay. This artisanal blend was procured and refined to keep your entire mouth refreshed and moisturized, ensuring pink gums and sparkling teeth that feel as pure and gleaming as they look. Oral Essentials is a truly contemporary take on oral care. Produced in small batches to maintain the highest level of quality in a BPA free bottle in California. Our products are FREE of GMO, preservatives, alcohol, parabens, dye, SLS, and sugar! 100% 30 DAY MONEY BACK GUARANTEE: The cause of tooth sensitivity? Tooth sensitivity has been on the rise in the last decade due to the popularization of whitening products containing baking soda or hydrogen peroxide (both break down enamel over time if used too frequently), the consumption of acidic foods and beverages, root exposure due to gum recession, and/or the increasing amount of people who clench or grind their teeth due to stress. STOP SENSITIVITY WITHOUT HARSH CHEMICALS: Oral Essentials has created a mouthwash to combat tooth sensitivity by leveraging our key ingredient, Dead Sea salt! This ancient and revered component contains dozens of minerals, including calcium, phosphate, magnesium, manganese and many more that bind together on the surfaces of teeth, filling in the little holes (called dentinal tubules) to reduce sensations of sensitivity to hot or cold, and sooth tissues. If you have any questions about this product by Oral Essentials, contact us by completing and submitting the form below. If you are looking for a specif part number, please include it with your message.